The Rasmusons spent fifteen years in Massachusetts, but after their children were grown, they were eager for an adventure and Nancy, who had been a school teacher for many years, went to Kenya for one year to teach. John schemed to join her and they spent three years teaching in Pakistan before September 11, 2001 took them out of Pakistan and relocated them in Venezuela. While living in these locales, cars were not a big part of their lives and so going to one car when they moved back to Salt Lake City was an easy decision. Today, living in Salt Lake City as active and engaged retired citizens, they each take classes at the University of Utah a couple of days a week and ride the three miles to campus for class. “Not only do we like the exercise of riding, we can’t understand why anyone would drive to the university with the parking as challenging as it is. We save time and hassles by riding our bikes.” When the weather is challenging, they take the bus to campus. 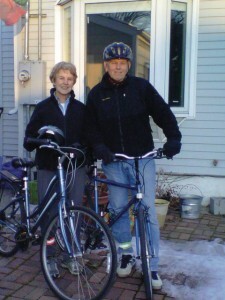 Nancy and John also ride their bikes or walk to the grocery store, their aging mother and mother-in-law’s house, church on Sundays, and yoga classes. Nancy prefers walking to riding when the terrain is flat as she feels it is better exercise but they also both enjoy recreational riding on the Jordan River Parkway and the bike path adjacent to the Legacy Highway. They own one car for the two of them but according to John, “We could live without a car and suffer no deprivation. We can walk, ride or take mass transit to restaurants, shops, the liquor store, grocery store, yoga, the University and church. It’s nice to have for getting to the mountains, fly fishing, and visiting our grandchildren in California, but we could figure out other options for those instances.” For those who think it’s not possible to live in Salt Lake City without a car, that seems to be changing. “A good day is when the car doesn’t get started” says John. We couldn’t agree more. John and Nancy and for those of us who breathe, we thank you for your efforts.